"anti-cloud": antsle "Private Cloud Server"
"The edge computing alternative to public cloud solutions like AWS." "No more worrying about extra cost when you launch a new Virtual Server! ﻿The antsle Edge Computing Box lets you run a mix of 100+ V﻿M﻿s﻿ and Containers (antlets) at the same time. 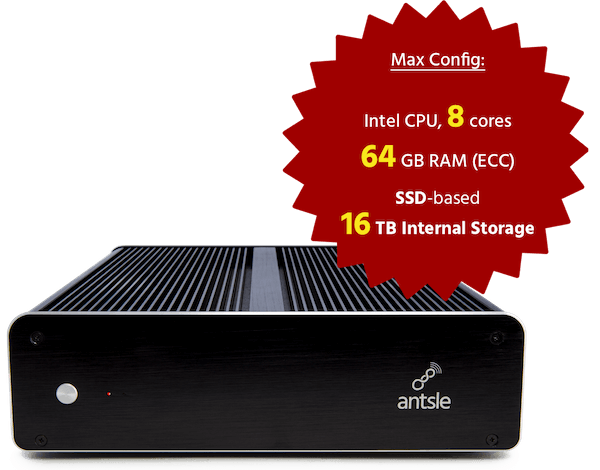 With up to 64 GB RAM and 16 TB disk space, antsle packs a punch! And we designed it to be 100% silent. No fans, no vent holes. "